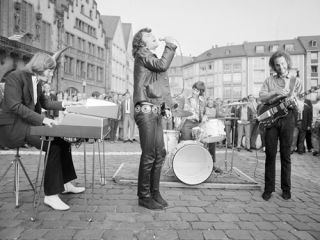 On 6 June 1970, The Doors played the Vancouver PNE Arena in Vancouver, BC, and as two onstage microphones captured the performance on a reel-to-reel tape recorder, the band churned out a mostly blues-soaked set, during which they were joined by guitar legend Albert King on four songs. The show, which featured 17-minute versions of both Light My Life and The End, has been released as a two-CD package called, appropriately enough, The Doors Live In Vancouver, 1970. For guitar fans and blues aficionados, the appearance of King on the songs Little Red Rooster, Who Do You Love (listen below), Rock Me and Money is reason enough to purchase the set. And they'd get little argument from keyboardist Ray Manzarek, who remembers the night as "one of the better gigs." Recalling the performance during an interview with the Vancouver Sun, Manzarek said, "It was exciting. Albert King was going to be playing the blues with Robby Krieger, while Jim Morrison sings." Going into greater detail, the keyboardist remembered, "A large audience, lights shining in my eyes, can't see the audience... The Doors are excited because Albert King is coming onstage, so we played great. Then Albert comes on, and we played even better. We played dark and deep and funky. Morrison was just transfixed by Albert King's manual dexterity and adroitness on the guitar, so he was in blues-boy heaven. "We were all blues boys. We had all gone to the south side of Chicago, which appeared magically in Vancouver, Canada. And we're playing the blues. We're a blues band on the south side of Chicago playing with Albert King. Great night, absolutely great, had a fine time." When asked if the band rehearsed with Albert King, Manzarek laughed and said, "Hell no! Are you kidding. What are we playing? The blues...is no problem."